Weird Dinosaurs - Really unique species. These are some really strange critters. Although well documented, most are rarely mentioned in popular literature. Cryolophosaurus ellioti is a good example. It had a bizarre crest running across its head. Due to its resemblance to Elvis Presley�s 1950�s pompadour hairstyle, it was nicknamed the "Elvisaurus." The paleontologist who described the ugly Majungatholus atopus, said, "It�s the kind of face that only a mother could love." The weird Masiakasaurus knofleri had forward-facing teeth, jutting out from its lower jaw; it really needed a good orthodontist. Stygimoloch spinifer sported bony spikes on its head. Tsintaosaurus spinorhinus had a horn protruding from its forehead, resulting in it being called, "the Unicorn Dinosaur." Plus there are nine more bizarre creatures. 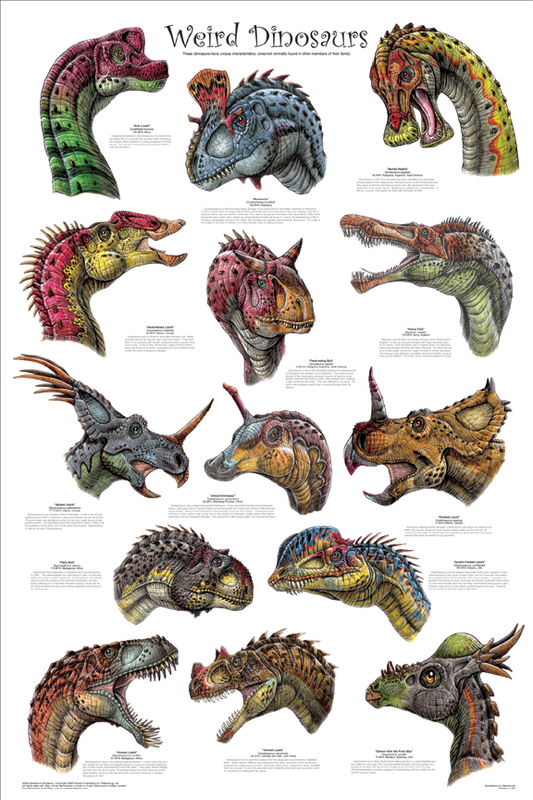 The Weird Dinosaurs have been magnificently illustrated by a leading paleontology artist to ensure anatomical accuracy. Fact-filled captions provide essential data and a description of the unique distinguishing characteristics. This poster includes exciting new discoveries, largely unknown to the general public. Visit Dinosaur-World.com for detailed information on the species.